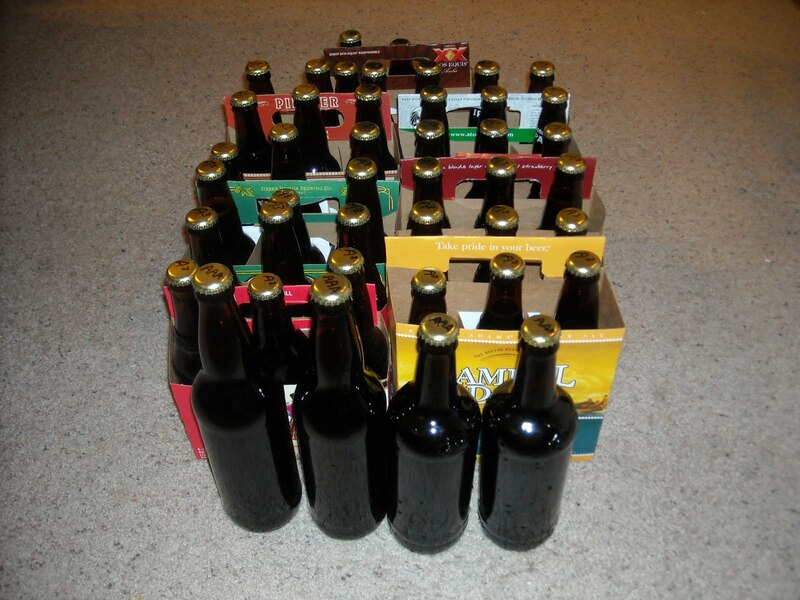 Tonight I bottled the Astro Amber Ale (AAA, or A-Cubed, for short), getting 39 of the 12-oz. bottles and 4 of the pint bottles. Not too bad of a yield! The uncarbonated brew is a nicely mild amber, but I will eagerly await to see how it matures over the next week or two. The final specific gravity was 1.021, no change from when it was transferred to the secondary. Thus, we have a final alcohol content estimated at 3.8 percent, making it a moderately lightweight amber ale. I must confess that I’m a little surprised by this – perhaps it is a result of using a different brand of yeast? AAA, all bottled up and ready to carbonate. This entry was posted in amber ale, bottling and tagged AAA. Bookmark the permalink. Fantastic! I tried my first bottle of the AAA today, and it had an excellent nose, a bit weak on the head, a sweet hoppy taste — overall, a remarkable effort!